Highlights of Ulster's thumping eight-try 58-12 win over Irish interprovincial rivals Connacht in the Pro12 game at Ravenhill. 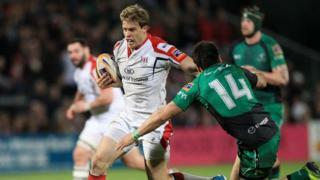 Andrew Trimble scored a hat-trick of tries and Paul Marshall added two, while Tommy Bowe, Luke Marshall and Craig Gilroy also touched down. Dave McSharry and replacement Darragh Leader were the try-scorers for an outclassed Connacht side.